“Who throws out leftover pasta?” I yelled at my friend (who had invited me over for a delicious dinner) who was about to toss out a whole colander full of perfectly good noodles. They were still warm! “What are you going to do with them?” she asked me. Fair question. I don’t cook—I present. Cheese, crackers, salads, artichoke dip. Cookies. I am an amazing milk-pourer on cereal—I must be, why else would my kids wait three hours for me to come home and do it for them? 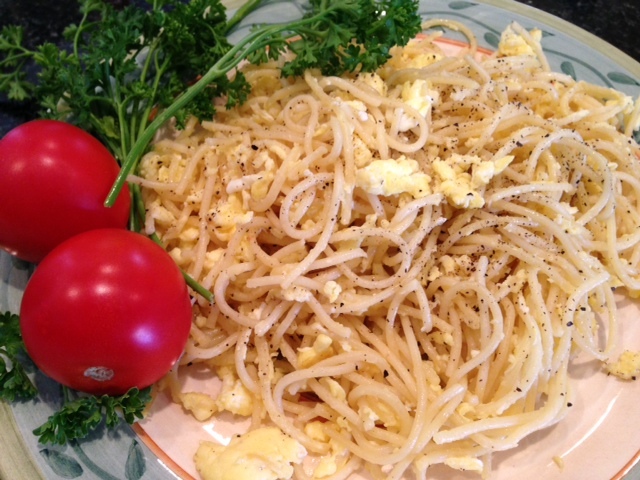 There is one dish my kids request, and it only has TWO ingredients: Fried Eggs-n-Noodles. The noodles have to be leftover, next day or five, preferably spaghetti. Glob A LOT of butter into the frying pan, add the old (don’t smell them) noodles, scramble in some eggs, salt and pepper, more salt, a little more, more. Garnish as desired. Oh, who am I kidding? It must be eaten with ketchup.